1. The cone crusher modular crushing plant is mainly used for secondary and fine crushing processing of medium hardness mineral and rock. 2. 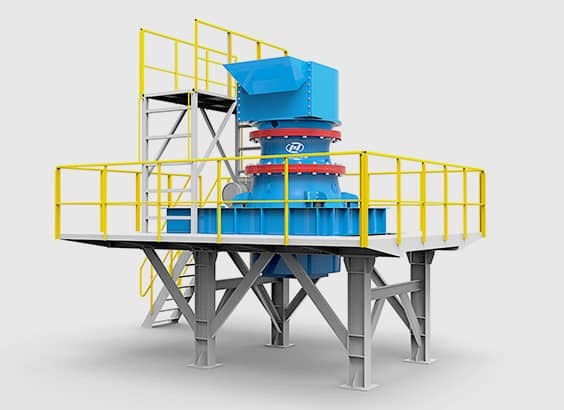 According to the different types of cone crusher configured, standardized modular equipment base structure is designed. 3. The modular structure is simple and smart, and all independent workpiece parts are connected by bolts, which is easy to installation, dismantling and transportation. 4. According to the needs of system design process, standardized materials bin and feed hopper module unit also can be configured. 5. The design of ladders, handrails and surrounding walkways is easy to inspect and maintain for any parts of the cone crusher. Main steel structures Support base, Maintenance platform, Ladder and railings, Feed chute and discharge chute,Stock bin(optional). Main steel structures Support base, Maintenance platform, Ladder and railings, Feed chute and discharge chute,Stock bin (optional).